Walks take place every Thursday and Sunday except for the E Group who walk on two Thursdays each month. Sunday walks meet in Brabyns Brow car park. Thursday walks meet across the road in Brabyns Park car park. 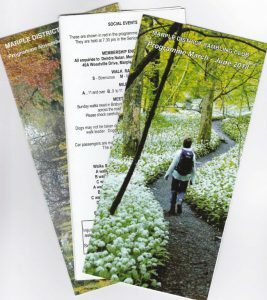 Please check the departure time in the walks programme – walks depart at the time specified so aim to arrive at least 5 minutes early. We are very fortunate to have willing leaders for all the walks published in our Programme. No pressure is place on members to lead walks although new volunteers are always welcome. All walks meet at the locations described in the left hand panel. Where members live closer to the start point of the walk information can be obtained from the walk leader. It is the member’s responsibility to be at the start location when the main group arrive. Car passengers are expected to contribute towards the cost of petrol. The suggested rate is 10p per mile. Click here to look at the current programme. Click here for the new spring programme. A new page has been added to the members area with the latest news for members. This will contain more information than the general news page which is only intended to show items that might be of general interest to none members. Click on Members News on the top level menu to go there.